With the holidays just weeks away, many smaller retailers are looking for ways to increase conversion in what is expected to be an epic shopping season. While many of the larger merchants won’t make a single change to their websites this late in the game, small business owners are likely turning to their designers and developers to develop a last-minute strategy that will boost sales. For that reason, Website Magazine has spotlighted three up-and-coming e-commerce sites that provide instant credibility builders that designers and developers can implement on their own sites fairly quickly and easily. 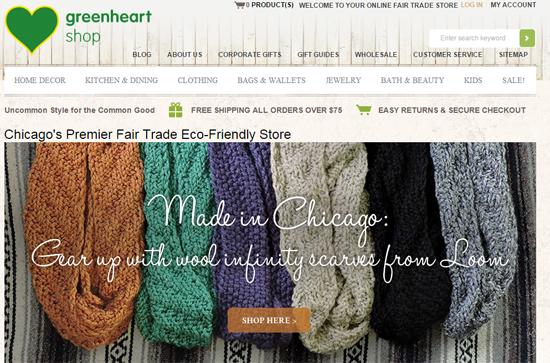 This Chicago-based retailer incentivizes its shoppers in a number of ways. For starters it includes the copy, “Free shipping all orders over $75,” which is, of course a real crowd-pleaser. Where its credibility-builder comes in, however, is its statement, “Easy returns & secure checkout.” In just a handful of words, Greenheart Shop alleviates two first-time buyer pain points. According to UPS, free shipping continues to drive purchasing decisions. Fifty-eight percent of respondents of a recent UPS survey indicated they have added items to their shopping carts to qualify for free shipping and 83 percent are willing to wait an additional two days for delivery if shipping is free. What’s more, 66 percent of respondents view a retailer’s return policy before making a purchase. 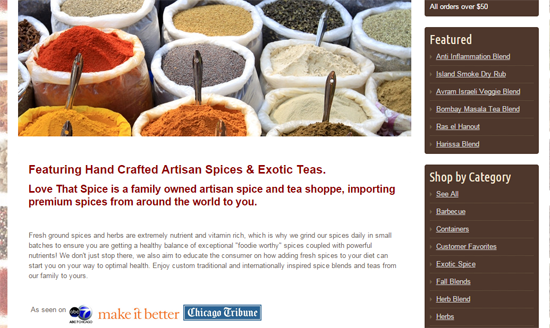 Another Chicagoland merchant, Love That Spice displays its accolades on its home page, “As seen on…” For local shoppers, ABC 7 Chicago and Chicago Tribune, specifically, bring a level of credibility to the merchant. Love That Spice may want to think about moving these recognizable logos above the fold, however. While certainly not a newcomer in the retail space, Hanna Andersson isn’t quite a household name either, so its site – although beautifully done – needs extra credibility indicators to move consumers toward purchase. In its website footer alone, Hanna Andersson includes its returns policy (a best practice), the Norton Secured seal (very recognizable) and its unconditional guarantee (which will assure first-time customers there is little risk involved with making a purchase).